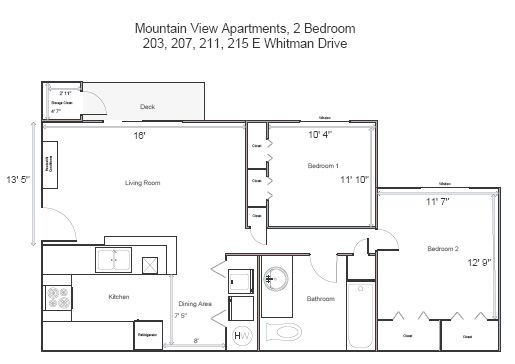 Village Housing has properties to meet a variety of needs from apartments (studio, one-bedroom, and two-bedroom) to 2- and 3-bedroom houses. 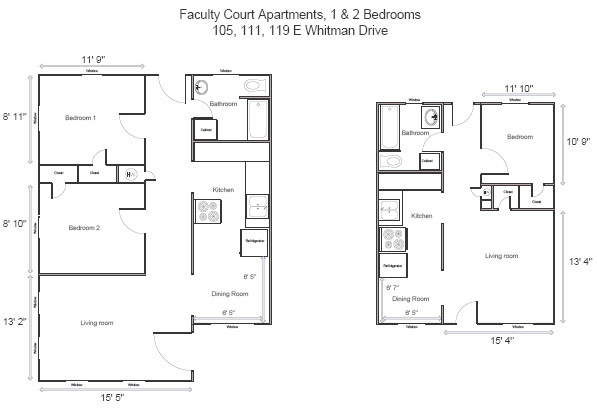 Our properties are available for rent by students and full-time faculty and staff on a first-come, first-served basis. Most housing options are within walking distance of the university so you remain an active part of our residential campus. Each apartment complex has an area coordinator who cares for the well-being of each community. These coordinators are here to answer your questions and make sure our community is safe. They also help you when you lock yourself out of your apartment, have an emergency, get sick and have no one to help, or have any other minor issues. Students in our campus housing enjoy our vibrant campus and local community, as well as the numerous events planned by the student-led Village Club. We look forward to welcoming you to our community. Residents will enjoy these two bedroom apartments, completed in the early 1990's. They are located just 1.5 blocks from campus. 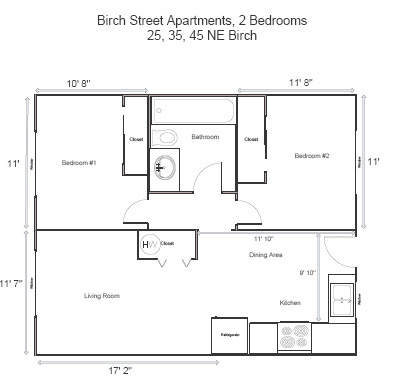 Residents will enjoy these charming apartments that were originally Married Student housing. Many of the apartments have been updated inside, and each apartment comes with a storage closet near the laundry facility. Located just 1 block from the main campus. These apartments were originally built to serve as Married Student Housing. Though older, many of the apartments have been updated on the inside. Just a short walk away from Rogers Bakery and the Village Housing Office. Our newest apartment community, construction for Mtn. View Apartments was completed in September of 2003. Ladders are provided in 3rd floor Mt. View apartments for use in an emergency that prevents escape from the front door. Please watch an informational video about the use of the escape ladder. NOTE: Please be aware that these ladders are to be used ONLY in the event of a fire that prevents escaping through the front door. Because these ladders are for emergencies only, we ask that you do not tamper with them at any other time. Tamper seals are placed on each unit to indicate improper usage. Should the Village Housing office be made aware that you have tampered with these fire escape ladders aside from the above mentioned, you will be fined $1,000 and asked to vacate your apartment immediately. Though originally built as a hotel, the university acquired the property to rent as studio apartments. 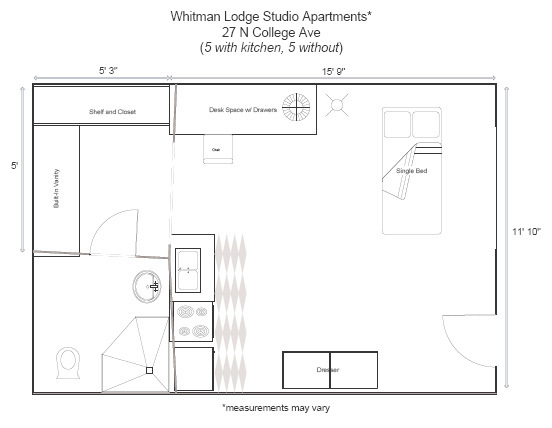 Just half a block from the main campus and directly across the street from the Village Housing office building, these studios are quaint apartments that fit a tighter budget. Monthly rent amounts for houses and house apartments vary greatly but are typically $450-$525 for a 1 bedroom, $650-$1,000 for a 2 bedroom, and $800-$1,200 for a 3 bedroom. Students and faculty/staff with university login credentials may apply online for housing during the open application period. Not everyone who applies will receive housing. Housing offers are made dependent on availability. Priority is granted to applicants who are married and/or have children and/or are 25 years of age or older. Housing offers are made to other applicants on a first-come, first-served basis. Before housing offers are made, applications will be reviewed to ensure eligibility is met. Housing offers are extended in waves and applicants notified via email. When an offer is extended, the applicant will have a specified period of time to accept or reject the offer. Offers will continue to be made until all available units have been reserved. Applicants who do not receive housing may re-apply for the following quarter. Students are responsible for finding their own roommates. Having trouble finding a roommate? List your name and contact information with the Village Housing office in case someone else is looking for a roommate. Another option is to search or advertise on the housing page in the WWU app. Jennyffer oversees the Homebase Program, processes off-campus housing requests, and keeps things running smoothly in the Village Housing office. Dorene oversees university-owned houses and apartments, and coordinates processes of properties from vacancy to occupancy. Dorene has worked at Walla Walla University since 2014, and joined the Village Housing team in 2017. She has worked in the Adventist education system for 20+ years, holds a bachelors degree in Organizational Behavior and Management, and has a well-rounded knowledge in both business practices and program development. Looking for a place to stay on campus while you're visiting?